Marathi (English pronunciation: i/məˈrɑːti/; मराठी Marāṭhī [məˈɾaʈʰi]) is an Indian language spoken predominantly by the Marathi people of Maharashtra. It is the official language and co-official language in the Maharashtra and Goa states of Western India, respectively, and is one of the 22 scheduled languages of India. There were 73 million speakers in 2001; Marathi ranks 19th in the list of most spoken languages in the world. Marathi has the fourth largest number of native speakers in India. Marathi has some of the oldest literature of all modern Indo-Aryan languages, dating from about 900 AD. The major dialects of Marathi are Standard Marathi and the Varhadi dialect. Malvani Konkani has been heavily influenced by Marathi varieties. Marathi has several features that set it aside from most other Indian languages. Marathi distinguishes inclusive and exclusive forms of 'we' and possesses a three-way gender system that features the neuter in addition to the masculine and the feminine. In its phonology it contrasts apico-alveolar with alveopalatal affricates and, in common with Gujarati, alveolar with retroflex laterals ([l] and [ɭ], Marathi letters ल and ळ respectively). Marathi is primarily spoken in Maharashtra (India) and parts of neighbouring states of Gujarat, Madhya Pradesh, Goa, Karnataka, Chhattisgarh and Andhra Pradesh, union-territories of Daman and Diu and Dadra and Nagar Haveli. The cities of Baroda, Surat, and Ahmedabad (Gujarat), Belgaum (Karnataka), Indore, Gwalior (Madhya Pradesh), Hyderabad (Telangana), and Tanjore (Tamil Nadu) each have sizeable Marathi-speaking communities. Marathi is also spoken by Maharashtrian emigrants worldwide, especially in the United States, United Kingdom, Israel, Mauritius, and Canada. Marathi is the official language of Maharashtra and co-official language in the union territories of Daman and Diu and Dadra and Nagar Haveli. In Goa, Konkani is the sole official language; however, Marathi may also be used for some official purposes in some case. Marathi is included among the languages which stand a part of the Eight Schedule of the Constitution of India, thus granting it the status of a "scheduled language". The contemporary grammatical rules described by Maharashtra Sahitya Parishad and endorsed by the Government of Maharashtra are supposed to take precedence in standard written Marathi. Traditions of Marathi Linguistics and the above-mentioned rules give special status to tatsamas, words adapted from Sanskrit. This special status expects the rules for tatsamas to be followed as in Sanskrit. This practice provides Marathi with a large treasure of Sanskrit words to cope with demands of new technical words whenever needed. In addition to all universities in Maharashtra, Maharaja Sayajirao University of Baroda in Vadodara, Osmania University in Hyderabad, Karnataka University in Dharwar, Gulbarga University in Gulbarga, Devi Ahilya University in Indore and Goa University in Goa have special departments for higher studies in Marathi linguistics. Jawaharlal Nehru University (New Delhi) has announced plans to establish a special department for Marathi. Marathi Day is celebrated on 27 February, the birthday of poet Vishnu Vaman Shirwadkar. Indian languages, including Marathi, that belong to the Indo-Aryan language family are derived from early forms of Prakrit. Marathi is one of several languages that further descend from Maharashtri Prakrit. Further change led to the Apabhraṃśa languages like Old Marathi, however this is challenged by Bloch (1970), who states that Apabhraṃśa was formed after Marathi had already separated from the Middle Indian dialect. Marathi literature began and grew owing to the rise of the Seuna dynasty of Devgiri, who adopted Marathi as the court language and patronised Marathi scholars. Further growth and usage of the language was because of two religious sects – the Mahanubhava and Varkari panthans – who adopted Marathi as the medium for preaching their doctrines of devotion. Marathi had attained a venerable place in court life by the time of the Seuna kings. During the reign of the last three Seuna kings, a great deal of literature in verse and prose, on astrology, medicine, Puranas, Vedanta, kings and courtiers were created. Nalopakhyan, Rukmini swayamvar and Shripati's Jyotishratnamala (1039) are a few examples. Notable examples of Marathi prose are "Līḷācarītra" (लीळाचरीत्र), events and anecdotes from the miracle filled life of Chakradhar Swami of the Mahanubhava sect compiled by his close disciple, Mahimbhatta, in 1238. The Līḷācarītra is thought to be the first biography written in the Marathi language. Mahimbhatta's second important literary work is the Shri Govindaprabhucharitra or Rudhipurcharitra, a biography of Shri Chakradhar Swami's guru, Shri Govind Prabhu. This was probably written in 1288. 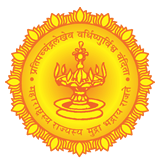 The Mahanubhava sect made Marathi a vehicle for the propagation of religion and culture. Mahanubhava literature generally comprises works that describe the incarnations of gods, the history of the sect, commentaries on the Bhagavad Gita, poetical works narrating the stories of life of Krishna and grammatical and etymological works that are deemed useful to explain the philosophy of sect. Dnyaneshwar wrote largest treatise of the initial time 1290 titled Dnyaneshwari. later, Saint Tukaram made important contributions to Marathi poetic literature in the Varkari panthan. Saints like Samarth Ramdas, Namdev, Moropant (creator of 'Aryas") and many others created famous literary works in Marathi. Marathi was widely used during the Sultanate period. Although the rulers were Muslims, the local feudal landlords and the revenue collectors were Hindus and so was the majority of the population. Political expediency made it important for the sultans to make use of Marathi. Nevertheless, Marathi in official documents from the era is totally persianised in its vocabulary. Marathi also became language of administration during the Ahmadnagar Sultanate. Adilshahi of Bijapur also used Marathi for administration and record keeping. The Varkari saint-poet Eknath lived from 1528–1599. He is well known for composing the Eknāthī Bhāgavat, a commentary on Bhagavat Purana and the devotional songs called Bharud. Mukteshwar translated the Mahabharata into Marathi; Tukaram (1608–49) transformed Marathi into a rich literary language. His poetry contained his inspirations. Tukaram wrote over 3000 abhangs or devotional songs. He was followed by Samarth Ramdas. Writers of the Mahanubhava sect contributed prose while the Varkari composed poetry. One of the famous Nath saints of this period was Dnyaneshwar (1275–1296), who wrote the Bhavarthadipika (1290), and Amritanubhava. He also composed abhangs. Dnyaneshwar gave a higher status to Marathi by translating the Bhagavad Gita. In the 18th century, some well-known works such as Yatharthadeepika by Vaman Pandit, Naladamayanti Swayamvara by Raghunath Pandit, Pandava Pratap, Harivijay, Ramvijay by Shridhar Pandit and Mahabharata by Moropanta were produced. Krishnadayarnava and Sridhar were poets during the Peshwa period. New literary forms were successfully experimented with during the period and classical styles were revived, especially the Mahakavya and Prabandha forms. The most important hagiographies of Varkari Bhakti saints was written by Mahipati in the 18th Century. The British colonial period (also known as the Modern Period) saw standardisation of Marathi grammar through the efforts of the Christian missionary William Carey. Carey's dictionary had fewer entries and Marathi words were in Modi script. The most comprehensive Marathi-English dictionaries was compiled by Captain James Thomas Molesworth in 1831. The book is still in print nearly two centuries after its publication. The late-19th century in Maharashtra was a period of colonial modernity. Like the corresponding periods in other Indian languages, this was the period dominated by English-educated intellectuals. It was the age of English prose, reformist activism and a great intellectual ferment. The first Marathi translation of an English book was published in 1817, and the first Marathi newspaper was started in 1832. Newspapers provided a platform for sharing literary views, and many books on social reforms were written. 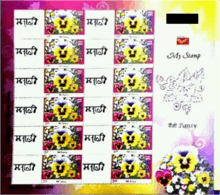 The Marathi language flourished as Marathi drama gained popularity. Musicals known as Sangeet Natak also evolved. Keshavasut, the father of modern Marathi poetry published his first poem in 1885. First Marathi periodical Dirghadarshan was started in 1840 while first Marathi newspaper Durpan was started by Balshastri Jambhekar in 1832. The first half of the 20th century was marked by new enthusiasm in literary pursuits, and socio-political activism helped achieve major milestones in Marathi literature, drama, music and film. Modern Marathi prose flourished through various new literary forms like the essay, the biographies, the novels, prose, drama etc. Chiplunkar's Nibandhmala (essays), N.C.Kelkar's biographical writings, novels of Hari Narayan Apte, Narayan Sitaram Phadke and V. S. Khandekar, Vinayak Damodar Savarkar's nationalist literature and plays of Mama Varerkar and Kirloskar's are particularly worth noting. After Indian independence, Marathi was accorded the status of a scheduled language on the national level. On 1 May 1960, Maharashtra was re-organised along linguistic lines; this added Vidarbha and Marathwada regions to its fold and thus brought major portions of Marathi population socio-politically together. With state and cultural protection, Marathi made great strides by the 1990s. Notable works in Marathi in the latter half of 20th century includes Khandekar's Yayati, which won him the Jnanpith Award. Also Vijay Tendulkar's plays in Marathi have earned him a reputation beyond Maharashtra. P.L.Deshpande(PuLa), P.K.Atre & Prabodhankar Thackeray, were also known for their writings in Marathi in the field of drama, comedy and social commentary. A literary event called Akhil Bharatiya Marathi Sahitya Sammelan (All-India Marathi Literature Meet) is held every year. In addition, the Akhil Bharatiya Marathi Natya Sammelan (All-India Marathi Theatre Convention) is also held annually. Both events are very popular among Marathi speakers. In 1958 the term "Dalit literature" was used for the first time, when the first conference of Maharashtra Dalit Sahitya Sangha (Maharashtra Dalit Literature Society) was held at Mumbai, a movement inspired by 19th century social reformer, Jyotiba Phule and eminent dalit leader, Dr. Bhimrao Ambedkar. Baburao Bagul (1930–2008) was a pioneer of Dalit writings in Marathi. His first collection of stories, Jevha Mi Jat Chorali (जेव्हा मी जात चोरली) (When I Concealed My Caste), published in 1963, created a stir in Marathi literature with its passionate depiction of a cruel society and thus brought in new momentum to Dalit literature in Marathi. Gradually with other writers like, Namdeo Dhasal (who founded Dalit Panther), these Dalit writings paved way for the strengthening of Dalit movement. Notable Dalit authors writing in Marathi include Arun Kamble, Shantabai Kamble, Raja Dhale, Namdev Dhasal, Daya Pawar, Annabhau Sathe, Laxman Mane, Laxman Gaikwad, Sharankumar Limbale, Bhau Panchbhai, Kishor Shantabai Kale, Narendra jadhav, and Urmila Pawar. In recent decades there has been a trend among Marathi speaking parents of all social classes in major urban areas of sending their children to English medium schools. There is some concern, though without foundation, that this may lead to marginalisation of the language. Standard Marathi is based on dialects used by academics and the print media. Indic scholars distinguish 42 dialects of spoken Marathi. Dialects bordering other major language areas have many properties in common with those languages, further differentiating them from standard spoken Marathi. The bulk of the variation within these dialects is primarily lexical and phonological (e.g. accent placement and pronunciation). Although the number of dialects is considerable, the degree of intelligibility within these dialects is relatively high. Jhadi Boli or Jhadiboli is spoken in Jhadipranta (a forest rich region) of far eastern Maharashtra or eastern Vidarbha or western-central Gondvana comprising Gondia, Bhandara, Chandrapur, Gadchiroli and some parts of Nagpur and Wardha districts of Maharashtra. Zadi Boli Sahitya Mandal and many literary figures are working for the conservation of this important and distinct dialect of Marathi. Thanjavur Marathi, Namdev shimpi Marathi and Bhavsar Marathi are spoken by many Maharashtrians in Southern India. This dialect is stuck in the 17th century and is old Marathi – it did not change from the time the Marathas conquered Thanjavur and Bangalore in southern India. It has speakers in parts of Tamil Nadu, Andhra Pradesh and Karnataka. Varhadi (Varhādi), or Vaidarbhi, is spoken in the Eastern Vidarbha region of Maharashtra. In Marathi, the retroflex lateral approximant ḷ [ɭ] is common, while in the Varhadii dialect, it corresponds to the palatal approximant y (IPA: [j]), making this dialect quite distinct. Such phonetic shifts are common in spoken Marathi and, as such, the spoken dialects vary from one region of Maharashtra to another. The phoneme inventory of Marathi is similar to that of many other Indo-Aryan languages. An IPA chart of all contrastive sounds in Marathi is provided below. Older aspirated *tsʰ, dzʱ have lost their onset, with *tsʰ merging with /s/ and *dzʱ being typically realised as an aspirated fricative, [zʱ]. This /ts, dz, zʱ/ series is not distinguished in writing from /tʃ, tʃʰ, dʒ, dʒʱ/. There are two more vowels in Marathi to denote the pronunciations of English words such as of a in act and a in all. These are written as अॅ and ऑ. The IPA signs for these are [æ] and [ɒ], respectively. Maharashtri Prakrit, the ancestor of modern Marathi, is a particularly interesting case. Maharashtri was often used for poetry and as such, diverged from proper Sanskrit grammar mainly to fit the language to the meter of different styles of poetry. The new grammar stuck, which led to the unique flexibility of vowels lengths – amongst other anomalies – in Marathi. Marathi retains the original Sanskrit pronunciation of certain letters such as the anusvāra (for instance, saṃhar, compared to sanhar in Hindi). Moreover, Marathi preserves certain Sanskrit patterns of pronunciation, as in the words purṇa and rāma compared to purṇ and rām in Hindi. An effort to conserve the "Modi Script" under India Post's My Stamp scheme. Here, the word 'Marathi' is printed in the "Modi Script". Written Marathi first appeared during the 11th century in the form of inscriptions on stones and copper plates. The Marathi version of the Devanagari alphabet, called Balbodh, is similar to the Hindi Devanagari alphabet. From the 13th century until the mid-20th century, Marathi was written in the Modi script. Since 1950 it has been written in the Balbodh style of Devanagari. Except for Father Stephen's Christ Puran in roman script in the 1600s, Marathi has mainly been printed using the devanagari script because William Carey, the pioneer of printing in Indian language only had the Devanagari Types. Subsequently, he tried Modi but by that time Balbodh Devanagari had been accepted for printing. Marathi is usually written in the Balbodh version of Devanagari script, an abugida consisting of 36 consonant letters and 16 initial-vowel letters. It is written from left to right. The Devanagari alphabet used to write Marathi is slightly different from the Devanagari alphabets of Hindi and other languages: there are a couple of additional letters in the Marathi alphabet, and Western punctuation is used. From the thirteenth century until 1950, Marathi, especially for business use, was written in the Modi alphabet — a cursive script designed for minimising the lifting of pen from paper while writing. Currently, due to the availability of Modi fonts and the enthusiasm of the younger speakers, the script is far from disappearing. Since Devanagari was difficult to type on Latin alphabet keyboards and does not display properly on old computers without the proper fonts, it became common for people to type Marathi in Latin script on social networking sites like Facebook and in online chats. Since it was a new trend there was no standardisation of phonetic and spelling rules. There is now widespread support of Unicode and availability of easy to use Devanagari transliteration on modern computers. In Devanagari, consonant letters by default come with an inherent schwa. Therefore, तयाचे will be 'təyāche', not 'tyāche'. To form 'tyāche', you will have to add त् + याचे, giving त्याचे. त्याचे - tyāche - "his"
प्रस्ताव - prastāv - "proposal"
विद्या - vidyā - "knowledge"
महत्त्व - mahatva - "importance"
फक्त - phakta - "only"
बाहुल्या - bāhulyā - "dolls"
In writing, Marathi has a few digraphs that are rarely seen in the world's languages, including those denoting the so-called "nasal aspirates" (ṇh, nh, and mh) and liquid aspirates (rh, ṟh, lh, and vh). Some examples are given below. न्हाणे - nhāṇe - "bath"
म्हणून - mhaṇūn - "therefore"
तऱ्हा - taṟhā - "different way of behaving"
कोल्हा - kolhā - "fox"
Marathi grammar shares similarities with other modern Indo-Aryan languages such as Hindi, Gujarati, and Punjabi. The first modern book exclusively concerning Marathi Grammar was printed in 1805 by William Carey. Marathi employs agglutinative, inflectional and analytical forms. Unlike most other Indo-Aryan languages, Marathi preserves all three grammatical genders from Sanskrit: masculine, feminine and neuter. The primary word order of Marathi is subject–object–verb Marathi follows a split-ergative pattern of verb agreement and case marking: it is ergative in constructions with either perfective transitive verbs or with the obligative ("should", "have to") and it is nominative elsewhere. An unusual feature of Marathi, as compared to other Indo-European languages, is that it displays inclusive and exclusive we also found in Rajasthani and Gujarati and common to the Austronesian and Dravidian languages. Other similarities to Dravidian include the extensive use of participial constructions and also to a certain extent the use of the two anaphoric pronouns swətah andapəṇ. Marathi neon signboard at Maharashtra Police headquarters in Mumbai. Over a period of many centuries the Marathi language and people came into contact with many other languages and dialects. The primary influence of Prakrit, Maharashtri, Apabhraṃśa and Sanskrit is understandable. At least 50% of the words in Marathi are either taken or derived from Sanskrit. Marathi has also shared directions, vocabulary and grammar with languages such as Indian Dravidian languages, and foreign languages such as Persian, Arabic, English and a little from Portuguese. While recent genome studies suggest some amount of political and trade relations between the Indian subcontinent and East Africa, Middle East, Central Asia over a millennium, these studies are still not conclusive about the exact effect on linguistics. Marjī "wish" is derived from Persian "marzi"
A lot of English words are commonly used in conversation, and are considered to be assimilated into the Marathi vocabulary. These include "pen" (native Marathi lekhaṇii) and "shirt" (sadaraa). Marathi uses many morphological processes to join words together, forming compounds. For example, ati + uttam gives the word atyuttam, miith-bhaakar ("salt-bread"), udyog-patii ("businessman"), ashṭa-bhujaa ("eight-hands", name of a Hindu goddess). Like many other languages, Marathi uses distinct names for the numbers 1 to 20 and each multiple of 10, and composite ones for those greater than 20. As with other Indic languages, there are distinct names for the fractions 1⁄4, 1⁄2, and 3⁄4. They are paava, ardhaa, and pauṇa, respectively. For most fractions greater than 1, the prefixes savvaa-, saaḍe-, paavaṇe- are used. There are special names for 3⁄2 (diiḍ) and 5⁄2 (aḍich). Powers of ten are denoted by separate specific words as depicted in below table. A positive integer is read by breaking it up from the tens digit leftwards, into parts each containing two digits, the only exception being the hundreds place containing only one digit instead of two. For example, 1,234,567 is written as 12,34,567 and read as 12 laakha 34 hazaara 5 she 67. Every two-digit number after 18 (11 to 18 are predefined) is read backwards. For example, 21 is read एक-वीस (1-twenty). Also, a two digit number that ends with a 9 is considered to be the next tens place minus one. For example, 29 is एकुणतीस/एकोणतीस (एक-उणे-तीस)(Thirty minus one). Two digit numbers used before hazaara, etc. are written in the same way. Shrilipee, Shivaji, kothare 2,4,6, Kiran fonts KF-Kiran and many more (about 48) are clip fonts that were used prior to the introduction of Unicode standard for Devanagari script. Clip fonts are in vogue on PCs even today since most of the computers in use are working with English Keyboard. Even today a large number of printed publications of books, newspapers and magazines are prepared using these ASCII based fonts. However, clip fonts cannot be used on internet since those did not have unicode compatibility. Earlier Marathi suffered from weak support by computer operating systems and Internet services, as have other Indian languages. But recently, with the introduction of language localisation projects and new technologies, various software and Internet applications have been introduced. Various Marathi typing software is widely used and display interface packages are now available on Windows, Linux and macOS. 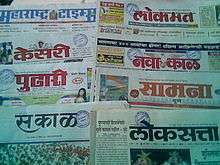 Many Marathi websites, including Marathi newspapers, have become popular especially with Maharashtrians outside India. Online projects such as the Marathi language Wikipedia, with 36,000+ articles, the Marathi blogroll and Marathi blogs have gained immense popularity. ↑ http://marathi.com/Marathi. Retrieved 5 December 2014. Missing or empty |title= (help) Marathi. Retrieved on 2013-07-28. ↑ Masica, Colin P. (1993). The Indian Languages. Cambridge University Press. p. 437. ISBN 9780521299442. Archived from the original on 7 December 2014. ↑ Rao, Goparaju Sambasiva (1994). Language Change: Lexical Diffusion and Literacy. Academic Foundation. pp. 48 and 49. ISBN 9788171880577. Archived from the original on 7 December 2014. ↑ Ajmire, P.E. ; Dharaskar, RV; Thakare, V M (22 March 2013). "A Comparative Study of Handwritten Marathi Character Recognition" (PDF). International Journal of Computer Applications. INTRODUCTION. Archived from the original (PDF) on 7 December 2014. ↑ Bhimraoji, Rajendra (28 February 2014). "Reviving the Modi Script" (PDF). Typoday. Archived from the original (PDF) on 7 December 2014. 1 2 The Goa, Daman and Diu Official Language Act, 1987 makes Konkani the sole official language, but provides that Marathi may also be used "for all or any of the official purposes" in some case. The Government also has a policy of replying in Marathi to correspondence received in Marathi. Commissioner Linguistic Minorities, , pp. para 11.3 Archived 19 September 2009 at the Wayback Machine. 1 2 Archived 7 November 2012 at the Wayback Machine. ↑ Hammarström, Harald; Forkel, Robert; Haspelmath, Martin; Bank, Sebastian, eds. (2016). "Modern Marathi". Glottolog 2.7. Jena: Max Planck Institute for the Science of Human History. ↑ Hammarström, Harald; Forkel, Robert; Haspelmath, Martin; Bank, Sebastian, eds. (2016). "Old Marathi". Glottolog 2.7. Jena: Max Planck Institute for the Science of Human History. ↑ "Abstract of Language Strength in India: 2001 Census". Censusindia.gov.in. Archived from the original on 10 February 2013. Retrieved 2013-05-09. ↑ arts, South Asian." Encyclopædia Britannica. Encyclopædia Britannica 2007 Ultimate Reference Suite. ↑ Dhoṅgaḍe, Rameśa; Wali, Kashi (2009). "Marathi". London Oriental and African language library. John Benjamins Publishing Company. 13: 101, 139. ISBN 9789027238139. ↑ Dhongde & Wali 2009, pp. 11–15. ↑ "Dept. of Marathi, M.S. University of Baroda". Msubaroda.ac.in. Archived from the original on 4 November 2012. Retrieved 2013-05-09. ↑ "University College of Arts and Social Sciences". osmania.ac.in. ↑ kudadmin. "Departments and Faculty". kudacademics.org. ↑ "Department of P.G. Studies and Research in Marathi". kar.nic.in. ↑ "List of statutes (Devi Ahilya University of Indore)". ↑ "Dept.of Marathi, Goa University". Unigoa.ac.in. 2012-04-27. Retrieved 2013-05-09. ↑ Bloch 1970, p. 32. ↑ Kulkarni, G.T. (1992). "DECCAN (MAHARASHTRA) UNDER THE MUSLIM RULERS FROM KHALJIS TO SHIVAJI : A STUDY IN INTERACTION,PROFESSOR S.M KATRE Felicitation". Bulletin of the Deccan College Research Institute. 51/52,: 501–510. JSTOR 42930434. ↑ Kamat, Jyotsna. "The Adil Shahi Kingdom (1510 CE to 1686 CE)". Kamat's Potpourri. Retrieved 4 December 2014. ↑ Keune, Jon Milton (2011). Eknāth Remembered and Reformed: Bhakti, Brahmans, and Untouchables in Marathi Historiography. New York, NY, USA: Columbia University press. p. 32. Retrieved 9 March 2016. ↑ Eaton, Richard M. (2005). The new Cambridge history of India. (1. publ. ed.). Cambridge: Cambridge University Press. p. 154. ISBN 0-521-25484-1. Retrieved 25 March 2016. ↑ Callewaert,, Winand M.; Snell, Rupert; Tulpule, S G (1994). According to Tradition: Hagiographical Writing in India. Wiesbaden, Germany: Harrassowitz Verlag. p. 166. ISBN 3-447-03524-2. Retrieved 9 April 2015. ↑ Natarajan, Nalini; Emmanuel Sampath Nelson (1996). "Chap 13: Dalit Literature in Marathi by Veena Deo". Handbook of twentieth-century literatures of India. Greenwood Publishing Group. p. 363. ISBN 0-313-28778-3. ↑ Issues of Language and Representation:Babu Rao Bagul Handbook of twentieth-century literatures of India, Editors: Nalini Natarajan, Emmanuel Sampath Nelson. Greenwood Publishing Group, 1996. ISBN 0-313-28778-3. Page 368. ↑ Mother 1970 Indian short stories, 1900–2000, by E.V. Ramakrishnan, I. V. Ramakrishnana. Sahitya Akademi. Page 217, Page 409 (Biography). ↑ Jevha Mi Jat Chorali Hoti (1963) Encyclopaedia of Indian literature vol. 2. Editors	Amaresh Datta. Sahitya Akademi, 1988. ISBN 81-260-1194-7. Page 1823. ↑ "Of art, identity, and politics". The Hindu. Jan 23, 2003. ↑ Assayag,, Jackie; Fuller, Christopher John (2005). Globalizing India: Perspectives from Below. London, UK: Anthem Press. p. 80. ISBN 1-84331-194-1. ↑ "Marathi language, alphabet and pronunciation". Omniglot.com. Retrieved 2013-05-09. ↑ Rao, Goparaju Sambasiva (1994). Language Change: Lexical Diffusion and Literacy. Delhi: Academic Foundation. p. 49. ISBN 81-7188-057-6. ↑ Archived 16 May 2008 at the Wayback Machine. ↑ "Wals.info". Wals.info. Retrieved 2013-05-09. ↑ Dhongde & Wali 2009, pp. 179–80. ↑ Dhongde & Wali 2009, p. 263. ↑ "Indian Numbering System". Oocities.org. Retrieved 2012-09-18. ↑ "Welcome to www.kiranfont.com". Kiranfont.com. Retrieved 2012-09-18. ↑ Askari, Faiz. "Inside the Indian Blogosphere". Express Computer. Archived from the original on 4 October 2008. Retrieved 2008-10-10. 1 2 3 4 "3 Puneites in race for Sammelan presidentship". The Times of India. Bloch, J (1970). Formation of the Marathi Language. Motilal Banarsidass Publ. ISBN 978-81-208-2322-8. Dhongde, Ramesh Vaman; Wali, Kashi (2009). Marathi. Amsterdam: John Benjamins Pub. Co. ISBN 978-90-272-38139. A Survey of Marathi Dialects. VIII. Gāwḍi, A. M. Ghatage & P. P. Karapurkar. The State Board for Literature and Culture, Bombay. 1972. Marathi: The Language and its Linguistic Traditions - Prabhakar Machwe, Indian and Foreign Review, 15 March 1985. 'Marathi Vyakaran' (Marathi Grammar) - Moreshvar Sakharam More.